Evolutionary biologists are now admitting we need “post-Darwinian” models to explain the Cambrian explosion. Casey is right; we really do need “post-Darwinian” models to explain the Cambrian explosion. Things like Mendelian inheritance, mutation, population genetics, and, in this context, palaeogeochemistry, which is why evolutionary biologists have been decidedly post-Darwinian since around 1905. Casey does not tell us what he is going to study, but I rather hope that it will be chemistry. Then, in due course, he will be fully equipped to explain to us that Dalton couldn’t even get the structure of water right, that Faraday’s electrical theory of bonding needs to be revised in the light of quantum mechanics, that many of the postulated intermediates in chemical reactions have never even been observed, that (as predicted by Intelligent Alchemy) many of Lavoisier’s elements turn out not to be elements at all, and that our schools should allow students to evaluate for themselves the unwarranted metaphysical assumptions of chemical materialism, and the merits of the phlogiston theory. Disclosure: unlike many far better people, I have been insulted by Casey only once, when he accused me and the British Centre for Science Education of concealing our atheism for tactical reasons. Guilty as charged; we conceal it so well that one of BCSE’s most prominent members at the time, now its official spokesman, is an Anglican priest. Devious, these evolutionists. You need to watch them. Casey, you will be sadly missed. Update; more here: http://pandasthumb.org/archives/2016/01/luskin-i-am-lea.html The word is that he will be replaced by Ann Gauger, who knows more biochemistry and therefore has, and uses, a much greater capacity for misunderstanding. This is my personal selection from the talk that Genie gave to the Glasgow Skeptics on Monday February 15, as best I recall it. I thank her for a copy of her slides, and any misinterpretation is entirely my own fault (I have added some comments of my own in parentheses). The first thing that would surprise Darwin if he could come back to life today would be the legend of his death-bed confession, to a certain Lady Hope, of reversion to Christianity and renunciation of evolution. Lady Hope is real enough. An evangelist and temperance crusader, she was a colleague of the philanthropist James Fegan, who ran a mission to London’s street urchins. Fegan corresponded with Darwin, who in 1880 gave him permission to use the reading room at Downe House for his work, and it seems plausible that Darwin and Lady Hope might have met around then. In 1915, we have Lady Hope being reported at a Baptist revival meeting as having said that she spoke with Darwin in his death bed, and that Darwin had confessed to a love of scripture, and to regretting things he had said when younger. More specifically, that as a young man with unformed ideas he had thrown out suggestions that to his surprise spread like wildfire. (I note that Darwin in his autobiography confessed to an initial love of Paley’s natural theology, and in The Descent of Man to surprise at the speed with which evolution had been accepted, and remarks of this kind may be the seed of Lady Hope’s account.) In 1915, Lady Hope was over 70, so knowing how memories are reworked, and how stories grow in the telling, we can see how the totally false story that we have today could have arisen without conscious mendacity. As for Darwin’s own views, he referred to belief in the punishment of unbelievers as “a damnable doctrine”, and may well have turned away from the idea of a benign deity after the death of his dear daughter Annie. (However, if I understand his Autobiography correctly, he continued to regard “this immense and wonderful Universe” as more than the product of mere chance, and eventually retreated into agnosticism only because he regarded the matter as beyond human understanding; I have discussed this here, and how more sophisticated modern creationists misdescribe his views here) . The Cococino sandstone layer, showing the cross-bedded structure. This, when examined together with small-scale and granular texture, identifies it as a wind-swept dune deposit. Darwin, who was a geologist before he became a naturalist, would be very puzzled by Young Earth creationism, since in his time the Churches accepted (and churchman geologists contributed to) the geological column and the implication of many millions of years. Young Earth creationism and “creation science”, as a claimant to speak for mainstream Christianity, only arose in the mid-20th century. “Creation science” needs to account for the plain facts of geology, and does so in extraordinary ways, asserting for example that the entire Colorado Plateau, successive strata with a depth of over a mile, were laid down and drained within a year by the waters of Noah’s Flood. 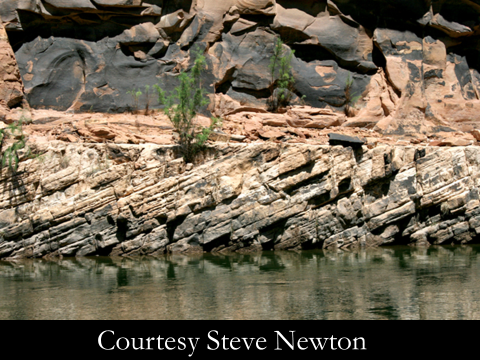 Hence creationists’ obsession with the Coconino Sandstone, whose texture and cross-bedded structure (as known since before 1945; see here and references therein) are characteristic of a wind-blown desert dune, and their extraordinary attempts to rationalise the claim that it was laid down under water. Creationist bodies are very active within the UK. Creation Ministers International has a UK branch (which caused furore by sending a speaker to the publicly funded St Peter’s Academy in Exeter, a mistake by the school that will not be repeated). There is Truth in Science (which sent copies of the creationist pseudo-text book, Explore Evolution, to every school in the UK), and others. Various bodies, such as Skeptics, Humanists, and the British Centre for Science Education, actively work to restrict their influence, and the Scottish Secular Society’s Public Petition PE01530 (with which regular readers will be very familiar) aims to keep creationism from being presented as valid in schools. Darwin would have been very interested in the direction of creationism in the UK, and the revival of the design argument, which he regarded as refuted by natural selection. When he considered the eye as a structure that at first appeared too complex to have arisen naturally, he pointed out that it could have arisen from a photosensitive spot, through a directional cavity, to an enclosed structure whose fluid would concentrate the light, and eventually, via the development of the enclosing membrane into a lens, to the complexity of the mammalian eye in its present form. We now know that all these imagined stages are actually evident in molluscs. He would have been delighted by continental drift, which solves long-standing puzzles in biogeography. Biogeography is one of the most convincing arguments in favour of evolution. It explains, as separate creation can not, why the flora and fauna of continental islands are closely related to those of the adjoining land mass, while those of oceanic islands are restricted and exotic. And yet, how come there were marsupials in Australia and in South America, but nowhere else? (North American marsupials crossed from the south, after the relatively recent closure of the isthmus between the two continents). We now know that marsupials appeared when present-day Australia, Antarctica, and South America were joined together in the supercontinent of Gondwanaland, allowing migration of marsupials from their original South American home, and indeed marsupial fossils have been discovered in Antarctica. He would also have been delighted to learn of Mendelian genetics, which solve the “dilution problem”. Under blending inheritance, a favourable variation would appear in less intense form in the offspring of the favoured individual, but genetic inheritance avoids this. Instead of the character being passed on with half the intensity, it is passed on with the same intensity to half the offspring. in the fossil record, and present-day creationists echo these laments, as if they were still warranted. Thus they commonly repeat a remark made some decades ago, to the effect that all known human ancestral fossils would fit onto a small table. Not any more. The human fossil record is now so rich, that we have more specimens of the relatively obscure species Homo habilis than we have of Tyrannosaurus rex. So the scientific record (including much not even touched on here), ever since the publication of On the Origin of Species, has been one of steadily reinforcing the central concepts of common descent, and of natural processes driving evolution. Q: Is there a risk that so uncompromising a talk would put off those sympathetic to creationism? AS: I would not give this talk to such an audience. There are those whose identity is bound up with creationist religion, whom I cannot hope to reach; those uncertain, to whom I would present the arguments for evolution; and those, like tonight’s audience, who need no convincing. A: Most ordinary creationists are either misinformed or muddled. The higher echelons go through considerable mental contortions, but I have no reason to doubt their sincerity. Q: How can we respond to those who consider “Goddiddit” a satisfactory explanation? A: Science is highly valued socially and culturally. So any ideologue tries to recruit science. Hence “creation science,” and devices like imagining the speed of light to have been much higher in the past, so as to allow light from galaxies billions of light years away to have reached us within 6,000 years. “Creation science” is a procrustean bed, on which all observations are distorted until they fit the initial biblical assumptions. This is contrary to the key moral value of science which is the admission of fallibility. Science as process depends on critical examination and revisability. We need to impart this, not by telling but by showing, and showing by asking. The dandelions on our lawn have short stems, but those over there have long stems. Why might that be? 1] This idea of overall cosmic design is of course the very opposite of the kind of piecemeal meddling that goes by the name of “Intelligent Design theory” today. The British Centre for Science Education (BCSE) has long maintained that the Seattle-based Discovery Institute (DI), of which Glasgow’s own Centre for Intelligent Design (C4ID) seems to be a satellite, is a religiously motivated Creationist organisation. Casey Luskin has now demonstrated this with great clarity in his response, in the misleadingly titled Evolution News and Views (“Serving the Intelligent Design Community”), to the recent opinion piece “Anti-Creationists need to think about tactics“, which we recently posted on this and on the BCSE website. Thanks Casey. As our title and opening words make clear, our piece is addressed by us, as individual nonbelievers, to other nonbelievers, giving our reasons for cooperating with believers in defending science against Creationism. It does not even mention DI, or C4ID, or Intelligent Design. Nonetheless, Casey seems to find our piece relevant to his mission. Perhaps his concern with religion is not surprising, since the foundation document of DI’s Centre for Science and Culture gives the restoration of a “theistic understanding” as a core objective. As for Intelligent Design, few people can still believe the pretence that it is anything more than a cover for Creationism (in the strict sense of the term as applied to biological diversity), but it is good to see our thoughts on these matters so authoritatively confirmed. He describes the two of us as spokesmen for BCSE, although the very first words of our article are “We write here as individual non-believers” [ emphasis added]. We are not spokesmen for BCSE, although we serve on its committee. The spokesman for BCSE is a distinguished historian of geology and theology, the Rev Michael Roberts, Vicar of Cockerham, Glasson and Winmarleigh. Casey selects BCSE as an example (his only example) of British secular and Humanist groups. Yet BCSE takes no position on matters of religion, a fact that he himself acknowledges later, nor on matters of Church and State relationships in general . This is clear from the BCSE website, and indeed from the very piece he criticises. He describes BCSE as a participant in “the ‘fight’ to teach evolution”, although such teaching has been, as it must be, part of the standard curriculum for decades. For those of you unfamiliar with the background, here are a few pointers. The Discovery Institute is a religiously driven Crypto-Creationist group pushing a stripped down and camouflaged version of Creationism called Intelligent Design. This approach was hastily adopted for legal reasons in the US, where schools in the public sector are not allowed to promote religion, when Creationism and later Creation Science were ruled in the courts to be religious, not scientific, doctrines. Creationist tactics rest upon three pillars. The first of these is that Evolution is in fact Atheism and that this whole political fight is one of Christians versus Atheists. No wonder Casey refers to BCSE as secular and humanist. We talk about this fact in the very piece that Casey is attacking. We mention that there are two reasons Creationists adopt this tactic. First of all the conflict narrative is effective for the recruitment and retention of Creationists to their cause, as to any cause that involves a conspiracy theory (see earlier post here). Secondly the conflict narrative is used to move the public debate away from “Creationism is daft” to genuine Atheist versus Christian issues. Creationists know that by framing the debate in such terms, they have a far greater chance of obtaining mainstream support. So you can see why the BCSE really do get up Casey’s nose. We are helping to stem his flow of recruits and we are making sure he fights on weak territory where he is very much outgunned. The second pillar of Creationism is to argue that Evolution (and by implication most modern science) is bad science. One basic technique here is quote-mining, taking words out of context, so that debate among scientists is misrepresented as rejection of the agreed foundations of the science. Casey’s commentary on our piece is a fine example of such quote-mining. As you can see, he uses it to pretend that our discussion of why we  support BCSE is an admission by BCSE of what would, if true, be gross hypocrisy. This technique works well when leavened with lies, since the only rebuttal is a potentially tedious analysis of the actual texts. Creationists regularly do this with scientific papers, and their fake textbook, the misleadingly named Explore Evolution, is based on this strategy. The third pillar of Creationism is an appeal to fairness. Usually Creationists need to stack the deck a little by lying about their opponents to make this approach seem reasonable. Just as Casey did in this case where he lies about our roles in the BCSE, the nature of the BCSE, the very existence of a respected Christian as our spokesman, our stated goal and the fact that we have already put this into practice. We ran a successful lobbying campaign that united notable scientists, atheists, Christians, secular and religious groups and contributed to a change in the way UK Free Schools are set up. Again this is actually described in the piece he is attacking. The main thrust of our article is actually advice from two atheists aimed at anti-theists and points to evidence that working with the religious through the BCSE is a very effective tactic for fighting Creationists. Casey has chosen to misrepresent this as a plot by BCSE to lure the religious into supporting an atheist agenda, and this forces him to lump his fellow Christians, when they defend evolution science, together with atheists. Perhaps now you can see why Casey is frightened of the BCSE approach. He needs to create a whole world of straw-men, if he is to avoid the truth. The truth is that his Creationist position is based on theology, and minority theology at that, and has no basis in science. We would really like to know, from your point of view; our article didn’t mention Intelligent Design at all, so, if the Discovery institute is not a Creationist organisation, why did you even bother with it? 2 Throughout this piece, as in our original piece, “we” and “our” refers to Mark Edon and Paul Braterman as individuals.